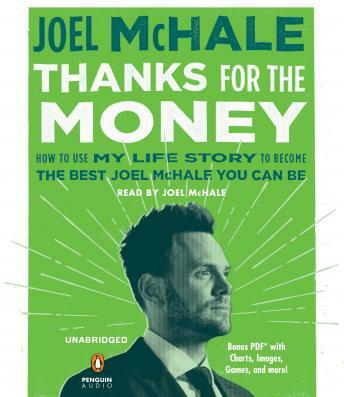 From actor and comedian Joel McHale comes the most important celebrity-penned book of this, or any, generation – Thanks for the Money: How to Use My Life Story to Become the Best Joel McHale You Can Be. Part shocking tell-all memoir, part aspirational how-to guide, and mostly all book, this one-of-a-kind tome is required reading for anyone who enjoys Hollywood gossip, get-rich-gradually tips, and copious illustrations and charts. Joel McHale pulls back the curtain on his personal journey to stardom! Here, for the first time, Joel reveals all that has molded him into the acclaimed comic actor he is today: a love of performance, a series of boyhood head injuries, and most importantly, a passion for financial compensation and free shoes. It’s all here: Joel’s career trials and tribulations, his criminal trials and tribulations, and an honest, unflinching list of all the people he’s been paid money to make out with, on camera. But the book does not stop there! Because if you want wealth, fame, and cost-free footwear, Joel will share every vital tip he has learned: an insanely low-carb diet plan, how to escape from a certain pseudo-religious celebrity cult, and more! How can you unlock the power of the Joel McHale who lurks inside? What happened when Joel fought his Community co-star Chevy Chase? And hey, while we’re at it, what’s up with Joel’s hair – really? All will be revealed, within the pages of Thanks for the Money. Buy now, and receive – as a special bonus – an email receipt that details your purchase! *Bonus PDF includes charts, images, games, and more!